For winter 2014, two themes have been selected: ski, with its black and white graphic motifs, and bon ton, with its more feminine, romantic pieces. 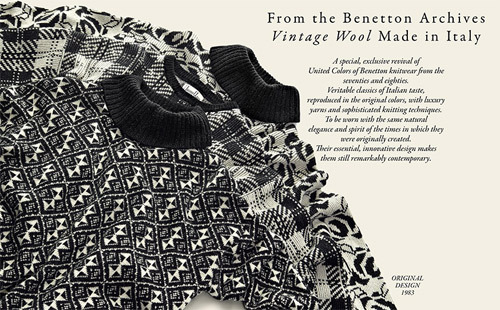 The original jacquard sweaters all date back to 1983, and were selected following a meticulous search through the Benetton archives. They are as powerfully expressive as ever, and their geometrical patterns and proportions are just perfect. The material used is a luxuriously soft Italian cashmere blend. The original designs, created by Benetton in the eighties, have been reproduced exactly as they were, with the same measurements and themes: lozenge motifs with an almost optical effect, stylized roses and highly modern jacquard checks. 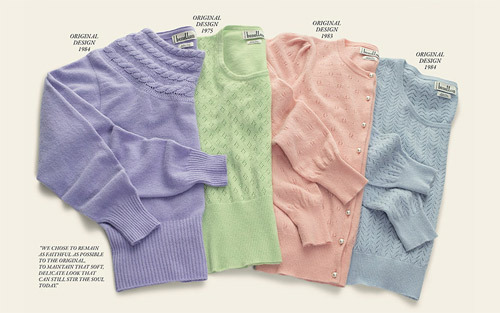 The soft sweaters of the bon ton collection offer a more elegant, refined appeal. Created in the late seventies and early eighties, they are made of delicate angorette in soft pastel tones. The colors were researched and reformulated so as to create an exact reproduction of the originals. The fit is very feminine: high ribbing to breast level, romantic necklines and sleeves with a slight gather at the shoulder. Wear “Vintage Wool” to relive the spirit of the eighties!